Think you know Hulu? Think again. Although it’s been around since 2008, Hulu is a very different service today than when it first launched. They have Live TV, original programs and more features than ever before. Before we get into what Hulu offers today, let’s take a quick trip down memory lane. Hulu launched in 2008 with an ad featuring Alec Baldwin which aired during Super Bowl XLIII. Subsequent ads featured Seth MacFarlane, Will Arnett, and others. Hulu introduced the world to an easier way to watch TV. For the first two years, all content on Hulu was free. Back then (although it’s not terribly long ago), watching TV shows online and on-demand was a fairly new concept. Hulu found success almost right away. But other streaming services entered the market, and soon Hulu’s content offerings were looking rather thin compared to the competition. In 2010, they launched a monthly subscription service called Hulu Plus. Plus subscribers had access to full seasons of TV shows, next-day current TV and a larger library of content compared to the free service. Unlike traditional Hulu, which could only be watched on PCs and laptops, Plus was available for smart TVs, gaming consoles, mobile devices and more. Plus hit 1.5 million subscribers by the end of its first year. In 2015, Hulu abandoned the Plus name. Although the free service continued to exist, Hulu became, for all intents and purposes, a subscription service. In what was arguably a bold move, Hulu showed ads to subscribers. As you might expect, people don’t particularly love seeing ads in a paid service. In 2016, Hulu stopped their free option. And why not? Their subscription service was thriving. Today Hulu is one of the top three streaming services along with Amazon Prime and Netflix. They offer original shows, tons of quality licensed content and even live TV. Let’s start with live TV, which I think is the most exciting new feature. It’s certainly what most sets Hulu apart from the competition like Netflix. Hulu Live TV launched in beta on May 3, 2017. It still has some hiccups, but there’s lots to like, too. What’s Available on Live Hulu TV? Let’s start with the most common question about any internet-based local TV service: Can you watch sports and local news? Yes, almost certainly, but the specifics will vary by area. Originally, Hulu’s local content was limited to New York, Los Angeles, Chicago, Philadelphia, and San Francisco. If you currently live in any of those areas, you’ll get lots of local content without a problem. Fortunately for everyone else, Hulu’s local options expanded quickly and continue to do so. Generally, if you live somewhat near a large-ish city, you should be able to get at least some of the local networks such as NBC, ABC, CBS, and Fox. However, check Hulu’s site for specifics. Entering your zip code returns a list of what local channels are available. You’ll also get a selection of local sports based on what’s available in your area. Live national news options include FOX News, CNN, and MSNBC. You’ll likely be able to watch live local news from the major networks, too. All live events can be recorded. A cloud-based DVR holds up to 50 hours. How Does Hulu Compare to Other Skinny Bundles? A skinny bundle is a standalone, internet-based television service which delivers popular content from cable networks combined with live local content. It’s called an Over the Top Television Service. You only need an internet connection. No cable or even television set required. Aside from Hulu, popular skinny bundles include Amazon Prime and Dish Network’s Sling. Each bundle varies, but you’ll find a lot of overlap. It’s an impressive lineup, but it does fall a bit short compared to many other popular skinny bundles. Most notably, Viacom is missing. That means there’s no MTV or Comedy Central. Discovery Communications and AMC are also missing, so no Discovery Channel or The Walking Dead. Where Can I Watch Hulu TV? During an early portion of the beta, Hulu Live TV was briefly unavailable on desktop. This led to some online rumors that it wasn’t particularly platform-friendly. But that’s all in the past. Today, Hulu Live TV works easily everywhere you’d expect. Requires Android 5.0 or above. Also, it only works if your screen size is 800 by 480 pixel or above. Generally, Hulu works on any Android device which can run a Google app such as Maps or Gmail. Live TV and Premium content require at least the 4th generation or Apple TV 4K. Google Chromecast support works, but there are some limitations to casting in general. You can stream video to your Chromecast from iOS mobile devices, Android mobile devices and Hulu.com with the latest version of Chrome. However, casting from Fire, Nook or Windows currently isn’t supported. All features, including live TV, work on both the Xbox 360 and Xbox One. Special features, the video library, and the latest Hulu app are all available on the PlayStation 3 and PlayStation 4, but live programming currently is not. Hulu is just getting started with Live TV, but don’t forget about the giant library of TV shows they’re known for. Live TV subscribers also get access to traditional Hulu, too. Each brings a lot of content to the virtual table. Hulu’s library of TV shows and movies is among the best. Hulu is a great service if you’re mainly interested in watching multiple seasons of popular, mainstream TV dramas and comedies. As you can probably guess from the corporate parentage, tons of NBC, Fox and Universal properties are available. Hulu’s TV offerings are far superior to their movies. While they do have many blockbusters, they’re usually a little older than what you’ll find on Netflix or premium cable channels like HBO or Showtime. Finally, Hulu’s been stepping up the quality of their Original Programming. Aside from critical and audience favorite The Handmaid’s Tale, newer shows like The Act and Shrill are also finding an audience. However, if you’re mainly interested in original programming, Netflix might be more your style. Where Can I Watch Classic Hulu? Subscribers can access Hulu’s library through any of the devices and platforms compatible with Hulu Live TV. But you have a few other options, too. You can get a $10 bundle discount if you buy both the Enhanced Cloud DVR and Unlimited Screens. It’s $68.97 if you get everything. Your cable rates will vary, but I found the price to be comparable to cable – and the selection of channels was pretty similar, too. Without Live TV, Hulu is significantly cheaper. It’s only $5.99 for unlimited access to their entire streaming library. For $11.99 a month, you get the same plan only commercial-free. Hulu has no long-term contracts. You pay monthly and can cancel easily at any time. If you want to come back later, all your settings will be waiting. 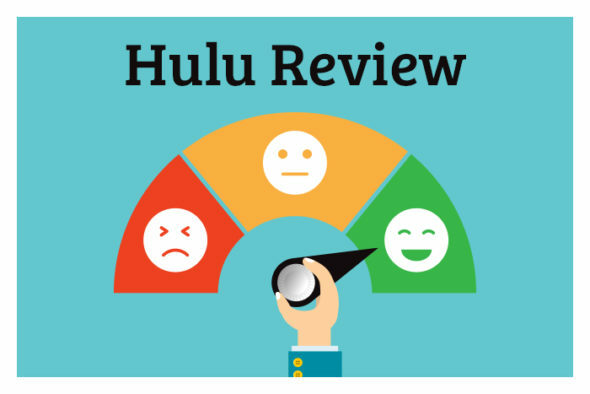 What is Hulu’s User Experience Like? It’s a little confusing at first. Hulu has a traditional app for your mobile device, computer, Smart TV, etc. You use it to navigate Hulu’s content library. But that app isn’t how you use Live TV. Hulu Live TV requires a separate app all its own. On the Hulu Live TV app, you can access the Hulu library. Which, when you think about it, is weird. Why not just have one app with everything? Why does one app only work for the video library while another is for the library and live TV? Plus, the Live TV app could use some work. On mobile, shows are organized individually instead of by category. You have to do a lot of scrolling if the show you want to watch isn’t among the first few listed. Also, there’s not much of a guide for live TV. Finding something you know is currently airing live, like the Super Bowl or even the nightly news, is usually pretty simple. But scrolling through live TV to see what’s on isn’t as smooth as it could be. Hulu’s traditional user interface has some issues, too. They used to have a Queue function. But they recently ditched it for a new section called My Stuff. It lists shows by Category, Title and then Episode. Finding unwatched episodes of a show has a needless step. You have to click on the show title first and then click on the specific episode. I’d often feel confused about which episodes of a show I’ve seen and which I haven’t. If you plan to record a lot of shows, take note; Hulu’s DVR is a bit different than you’re probably used to. If you record something, but an on-demand version is available, Hulu forces you to watch the on-demand version. Here’s the tricky part: You can’t fast-forward through the on-demand shows. Should I Subscribe to Hulu in 2019? Hulu Live TV is an interesting blend of two types of online services. They have a large library of existing content including many current TV shows and movies. In that sense, they rival Netflix. By adding Live TV, they’ve entered the skinny bundle market, too. So, in another sense, Hulu is now competing with Sling and similar services. Hulu Live doesn’t excel in live TV options, but it’s not bad at all. What it may lack in Live TV it more than makes up for with its huge library of TV shows and movies. Not sure if Hulu is right for you? Do you currently have cable TV? If you watch a wide variety of cable channels, Hulu Live TV might not be for you. At $49.99, Hulu with Live TV is probably just a bit cheaper than what you’re paying for cable. You’ll likely get fewer channels, too. If you’re a regular cable TV watcher, you might miss Comedy Central, MTV, AMC, and other popular channels. However, Hulu with Live TV is often a great deal if you mainly watch local news and sports. Don’t pay the cable company for hundreds of channels if you only watch a handful. Hulu with Live TV is great if you want to watch sporting events, national news, and local programming but otherwise don’t watch much cable TV. If you don’t have cable TV and are only somewhat interesting in watching it, then Hulu with Live TV is worth consideration. While it doesn’t have as many channels as other skinny bundles like Sling, that might not matter if you only watch cable occasionally. Plus, you get unlimited access to Hulu’s library of TV and movies, which Sling can’t compete with. Hulu has a limited, but growing, live TV service combined with a robust library of TV and movies, including current seasons of many popular shows. While their user interface could use some work, overall Hulu offers a lot of quality content and flexible pricing. Does Hulu sound like the service for you in 2019? Check it out here.